The City of Madison Office of Business Resources and Madison Gas and Electric partnered with the Northside Planning Council, Northside Economic Development Coalition, Northside Business Association, Northside News and the Madison Region Economic Partnership to present the first Northside Business Walk on September 8, 2016. 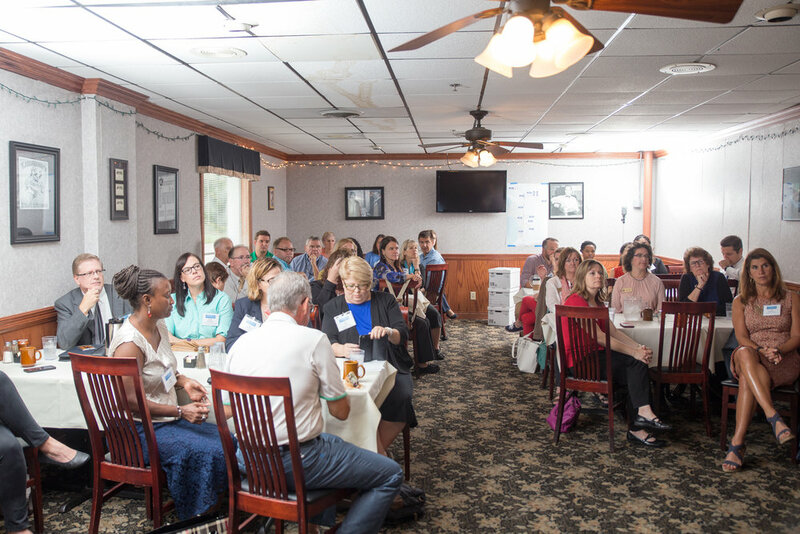 A Business Walk is an economic development initiative that, in a short amount of time, allows local leaders to get the pulse of how a business community is doing. The premise behind each walk is to “locate the successes and obstacles the local business community is facing and then track that information and provide assistance.” In total 47 business and civic volunteer's were divided into 12 different groups (two to three people per group) + 3 large employer groups. The 47 volunteers visited 146 businesses in three hours. · What do you like about business on the Northside? · What can be done to improve business on the Northside? · Will your business be affected by the closing of Oscar Mayer? A few members from the business walk planning committee. Thank you Willy Street - Co-op North for being our bag sponsor! Each group was assigned a specific area, 12 areas + three large employer groups. When the business walk was completed, 40 companies were followed up with directly. These companies addressed needing additional help or mentioned a major problem to the volunteers. The City of Madison Office of Business Resources coordinated the City’s response to a number of municipal issues brought up by business owners. The Engineering Department, Madison Police, Community Development and Economic Development Departments were connected to the businesses owners and ongoing follow-up is occurring. The Northside Economic Development Coalition and the Northside Business Association look forward to collaborating with the City of Madison and other economic development partners on Northside projects for the next one to two years and using the report to guide these efforts. A final report with the business walk findings will be added to the blog very soon. Here are a few pictures from the event. The program features a half-day blitz of a business community by trained volunteers who ask business owners/managers a very short list of four questions (see below). b.) What do you like about doing business in your area? c.) What can be done to improve doing business in your area? d.) Would you like someone to follow up with your company after the walk? This brief format allows for 100-200 businesses to be reached in two to three hours. A typical half -day Business Walk will include breakfast/registration, training for the volunteers, a business walk in the community, lunch, and a debrief session. Overall, coordination of the event from start to finish typically takes two to three months. The Business Walk Program helps communities create a unified voice and build a stronger relationship between the business community and local government. The program has also initiated change of burdensome regulations, created crime prevention programs and the 3/50 project. But most importantly, it has allowed communities to target and assist companies at risk: saving them from going out of business, relocating to another community, and saving local jobs. Contact Blueprint Events to see how the Business Walk Program can jump start your community’s business retention and expansion efforts! This half day conference hosted national and local speakers who addressed the state of the startup environment in the Madison Region. They spoke about successes as well as opportunities to improve and there was great discussion created around challenges entrepreneurs face in Wisconsin. Some would say "the event started off with a bang and ended with a bang" (see Cap Times article). Panel Response: John Biondi, Director, Discovery 2 Product (D2P) (moderator), Troy Vosseller, Co-Founder, gener8tor (left), Dude Frank, Co-Founder & CTO, Comply365 (middle), and Wes Garnett, Co-Founder & CEO, Kurbi Health (right). The room was filled with a mix of business and civic leaders as well as entrepreneurs from all over Wisconsin. The discussion ended with business leaders and policy makers thinking about what they can do to help create a more successful entrepreneurial ecosystem in our state. One thing for sure... the conversation definitely does not and should not stop here. Make sure you #createyourownblueprint for every event you do. What is a Business Walk? A Business Walk is an economic development initiative that, in a short amount of time, allows local leaders to get the pulse of how a business community is doing. The information gathered is then used to help advocate for the business community as a whole, and is also used by economic professionals to identify which businesses require further outreach. Why were Business Walks developed? The initiative was created because economic development professionals realized there was a need for Business Retention and Expansion (BRE) on a large scale. However, many economic development organizations simply lack the time and resources to do it all alone. To that end, Business Walks can be used to help you quickly identify individual businesses, which are facing threats and/or opportunities, thereby necessitating further contact to direct them to appropriate resources. The program was developed not to replace traditional BRE outreach but to enhance it, serving as an entry-level opportunity for BRE efforts. Part 2: How does it work? Why have one in your community?